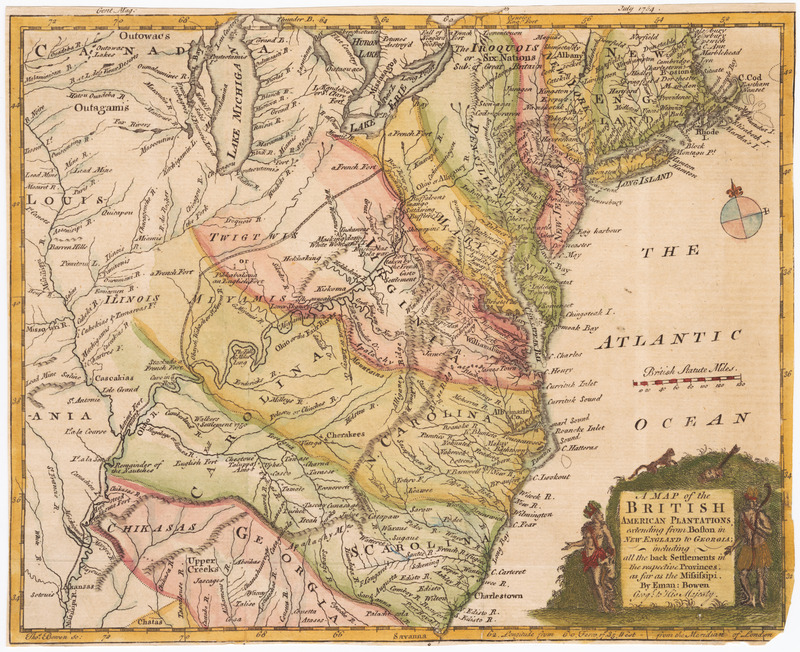 The map of the "British American Plantations" was produced by Emanuel Bowen, "Geographer to His Majesty," George II, and engraved by his son, Thomas Bowen. See French 1999, 176. It was published in The Gentleman's Magazine of London in July 1754. Jolly #47. The map makes it clear that the claims of the Crown's colonies (here, "Plantations") extend to essentially all the land east of the Mississippi. Included within the British claims are six places explicitly labeled as the sites of a "French Fort," including two as far west as modern Illinois and Missouri. It is possible that these forts were shown simply in recognition of the facts on the ground, but it may also have been an intentional signal of the British willingness to confront the French. What makes this map unusual, if not unique, is the orientation of the western and northern boundaries of the British colonies. The borders of New England, New York, New Jersey and Pennsylvania extend essentially due north, ending only at the frame of the map and apparently extending into modern Canada. Maryland reaches northwest to the shores of Lake Erie. Virginia and North Carolina extend northwest to a point well beyond the Ohio and the Wabash, and the borders of South Carolina and Georgia angle more to the west, ending at the Mississippi. The geography of Bowen's "British American Plantations" was short-lived, superseded in early 1755 by the publication of the Mitchell map, "the most important map in the history of American cartography." The Mitchell map set forth British territorial claims in North America very differently, with the borders of Virginia, North and South Carolina, and Georgia extending on parallels of latitude west to the Mississippi and beyond, to the western frame of the map. Because of its detail and size, the Mitchell map quickly became the definitive statement of British claims in North America, to the point that it served as the principal basis for delineating the borders of the newly-independent United States of America at the Treaty of Paris in 1783. The Gentleman's Magazine, London, July 1754.